Emily and Mark are co-owners of TapSnap 1129 and partners in everyday life. When not busy TapSnapping at social and corporate events around the Washington DC area, they can be found chasing after their two young and very active boys, spending time with family and friends, or traveling around here and there. Why TapSnap? What was it about our business that appealed to you? Mark: We both had highly successful professional careers, yet still harbored entrepreneurial spirits. Over the last few years, we had considered a number of business ideas. When we found TapSnap, we knew it was the perfect fit for us. I have a background in technology, I’m extraordinarily tech savvy, and I’m well versed in business operations, while Emily is outgoing and social with extensive experience in both economics and business management. Emily: We also both felt comfortable with the level of investment that would be required to get our TapSnap business off the ground. In addition, we liked that we would be able to operate the business on a part-time basis until such time that our revenues had grown sufficiently to support our young family. We really love owning our own business. We now have more flexibility in our work schedules, enabling us to spend more time together as a family—which is one of the biggest advantages of owning a franchise. It is also gratifying to see that the time, energy, and resources that we have invested in our business have directly translated into our early success. We look forward to continuing to grow and develop our TapSnap franchise. What made you decide to look at franchising versus other business opportunities? Mark: We actually did have some other business ideas of our own that we had begun to pursue. However, with my demanding, full-time career and two small children to raise, we determined that it was going to be very difficult to allocate the time and resources necessary to take those concepts all the way to market. We had also considered some other franchise concepts prior to choosing TapSnap, but none of the others checked all of the boxes like TapSnap! What were you doing before you decided to become a (full-time) franchise business owner? Mark: I began my career in IT, spending more than 10 years working on a variety of different types of projects – everything from networks to security to application development to web development. I love all things tech, which explains why we have computers in every room (many built from spare parts) and servers in our basement. Toward the end of my time in IT, I obtained an MBA and seized a passion for architecture and love of finance to transition into commercial real estate, where I remained for the 8 years prior to moving into TapSnap on a full-time basis back in April. Emily: I worked at an economic consulting firm for 8 years, specializing in intellectual property in pharmaceuticals and health care. I loved my work there and found success working on complex valuations. I took time off after having each of our two boys to be a full-time mother. Did you experience any challenges when opening your business? What were they and how did you resolve them? Mark: None that come to mind. What are some of the most positive experiences you’ve had as a TapSnap franchisee? Emily: We have had so many positive experiences with TapSnap. Most of all, we are delighted to see how happy people are when interacting with the kiosk. Running the events is such a thrill – guests are impressed by the technology and excited to give it a try for themselves. We enjoy facilitating their interactions to help them create fun, customized, one-of-a-kind photos. We know we’ve done a great job when we are hired by a past event guest to participate in their upcoming event, which happens quite often. We both really enjoy working with clients in advance of events to ensure that every aspect of an event is successful. For example, we spent a good deal of time working with the folks at Capital Bank on their client appreciation and website launch event. 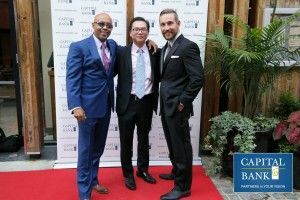 At the event, our Social Photographer provided guests with a Hollywood experience, by taking their photos in front of a physical step and repeat after entering through a red carpet and stanchions. Inside, guests were able to view, customize, print, and share their “celebrity” photos. Likewise, guests were able to take additional photos at the TapSnap Kiosk with colleagues and friends. We provided SnapCast to display all of these photos in a dynamic, high tech, social media-fueled “slide show”. We also provided a TapSnap Kiosk for clients to provide bank testimonials, which the client indicated added a lot of value. We even coordinated and arranged their AV services for them. Capital Bank was thrilled with the experience and let us know that they intend to have TapSnap at all of their future events. Lastly, we have really enjoyed working with our non-profit clients (e.g., March of Dimes, Special Olympics, Children’s National, Virginia Airborne Search and Rescue Squad, HomeAid, and many others). We are able to provide premium products and services that enable these organizations to generate substantial sponsorship funding while also enjoying the greatly enhanced social media coverage that TapSnap offers. These charity events have been very meaningful to us. Do you have a favorite type of event you like attending? Mark: We’ve honestly had a great time at every event that we have attended thus far, but some of the larger corporate and charity events have been some of the most exciting for us. We’ve been fortunate enough to have the wonderful opportunity to work with some big names like Accenture, Audi, Bloomberg, Neiman Marcus, Special Olympics, and March of Dimes, as well as professional sports teams such as the Washington Capitals and the D.C. United. You’ve been in the business for about a year now. What has changed for you between then and now? Emily: Our business has grown rapidly over the course of the last year. To go from literally non-existent to where we are now has been really exciting! We just recently expanded our franchise to include a larger geographic area and an additional kiosk. We’ve also purchased and incorporated all of the newer products into our business, including the new cameras for the Social Photographer as well as the Sharing Station. It’s kind of cliché, but it’s hard to believe how far we’ve come in such a short time! What lessons did you learn along the way? Would you have done anything differently? Mark: When starting any new business, there are certainly things that you learn along the way or wish you could have done differently. You’ll get a lot of advice from others, but ultimately it is your business, so you have to learn to listen to your own “gut.” It’s also important to explore and experiment. We tried some things that worked and some that didn’t, but we learned something valuable from each and every attempt we’ve made. What makes TapSnap so special, and why do you think people love it? 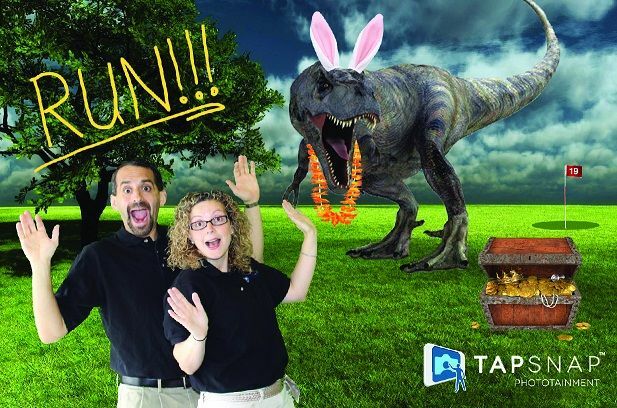 Emily: There are lots of “regular” photo booth rentals out there, but none that combine the flexibility, interactivity, potential for customization, social media connectivity, and quality of both product and service that TapSnap offers. Mark: TapSnap provides a unique, interactive, and fun form of photo entertainment that literally inspires our guests’ creativity. Many of our guests tell us that they’d love to have TapSnap in their living rooms! There are zillions of backgrounds and props for guests to choose from. The potential for additional customization is limitless. The integration with social media is unparalleled. We take professional quality photos and provide lab quality prints. We provide a top-notch guest experience. Guests are not constrained by the number of people in a photo. In fact, there are virtually no constraints or limits on what we can do. Finally, our SnapCast social media wall and cool new Social Photographer service integrate seamlessly into the TapSnap ecosystem, increasing the potential for guest interaction, enhancing the overall guest experience, and further accelerating the social media buzz generated during the event. Emily: TapSnap is so much more than just a “photo booth”. TapSnap provides cutting edge photo entertainment, social media coverage, guest engagement, and data capture. There truly is nothing else like it. What are your secrets for success, and what advice can you give to new franchisees entering the business? Mark: Don’t sit back and expect the business to come rolling in on its own. You have to decide which clients or what type of clients that you want to pursue, figure out how best to reach them, and then just do it! Your success or failure is totally up to you. The level of effort that you put in to the business will directly translate into how successful you are and how quickly you grow.